Coal refuse is a legacy of previous coal mining and consists of low-quality coal mixed with rock, shale, slate, clay and other materials. RPM Solutions is a reclamation, ash management and environmental services company that deals with such matters as coal refuse. RPM Solutions uses proprietary equipment technology and refined operating skills to provide an innovative approach to coal yard reclamation, ash management and coal refuse. Coal refuse is generally defined by a minimum ash content combined with a maximum heating value, measured on a dry basis. Coal refuse mining rejects are a low BTU-value material generated by the coal mining process. The material consists primarily of non-combustible rock with some attached carbon material that cannot be effectively separated due to its small size. It is estimated that the annual production of coal refuse exceeds 10 million tons in Virginia alone. It has been estimated that there are over 120 million tons of coal refuse from over 600 coal preparation plants in 21 coal-producing states. Safe, economical and environmentally acceptable disposal of coal refuse has been made possible through the application of technology from the disciplines of geology, soil and rock mechanics, hydrology, hydraulics, geochemistry, soil science, agronomy and environmental sciences. The primary purpose of a coal refuse disposal facility is to dispose of unusable materials from mining. Coal refuse is composed of rock fragments such as friable shale materials and it typically includes varying amounts of coal that can have an effect on material behavior. Metals and sulfur present in some coal refuse materials may result in environmentally undesirable leachate water with serious corrosive characteristics that require special measures such as liner and collection systems to neutralize acid production of the refuse. The potential for variations in coal refuse production as a result of mining or processing plus the long-term phased method of refuse placement should be accounted for with the disposal of coal refuse. Coal refuse disposal occurs year-round. 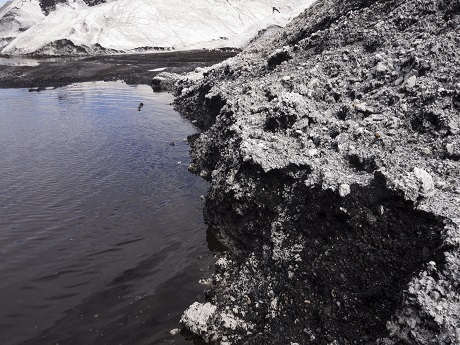 Coal refuse piles have too often become permanent fixtures on the landscape and are responsible for environmental degradation, as well as being hazards and eyesores. They generally don’t support the growth of much vegetation and are characterized by their steep, unstable dark gray banks. Many coal refuse piles can be commercially reprocessed to harvest the remaining coal waste from the other waste materials, especially those having high coal content. For coal piles having little commercial value, other reclamation methods may have to be employed. One such method is to regrade the pile to eliminate steep slopes using various water management practices to keep water from infiltrating the pile.